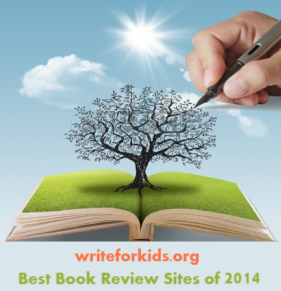 It's turning out to be a stellar year for nonfiction books for children, and it's only January. 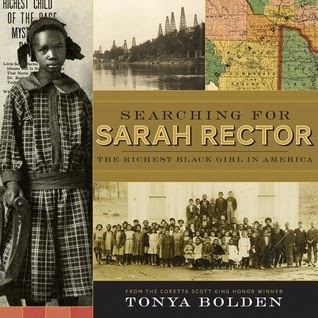 One of those amazing nonfiction titles from 2014 is Searching for Sarah Rector by Tonya Bolden. 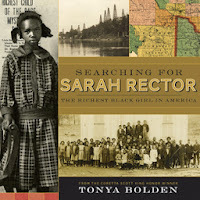 I love books that introduce me to a topic that was previously unknown to me, and Searching for Sarah Rector is a prime example. The story centers around a black child named Sarah Rector who lived in the early twentieth-century. Rector's great-grandmother was a slave owned by Chief Opothole Yoholo of the Creek tribe. When the U.S. government forced Native American tribes off their land onto Indian Territory, their slaves traveled with them. This meant that Sarah and her family, who were living on Indian Territory, were considered Creek citizens. At the turn of the century, each individual living on Indian Territory was awarded 160 acres of land in Oklahoma as part of a government allotment. In 1907, at the age of five, Sarah Rector became a landowner. She had no idea that the land she owned was full of oil, and that by the age of twelve she would become a very wealthy young lady. Bolden thoroughly researched the story of Sarah Rector and how her money was managed by a guardian appointed by the court. The story gets even more intriguing when newspapers published false reports that Rector was missing and may have been murdered by unscrupulous people who wanted her wealth. This rumor proved to be false and Bolden uses is as an example to show readers how unreliable news organizations could be before reporters could travel by air, highway or use telephones to access information. The newspaper articles prompt W.E.B. Dubois, a founder of the NAACP, to investigate Rector's situation to make sure she is safe and that her money is protected. Booker T. Washington heard about Sarah and invited her to attend his Tuskegee Institute, but Sarah stayed with her family in a home she had built for them. The design of Searching for Sarah Rector is outstanding. Primary documents such as maps, photographs, township allotment charts, legal documents and newspaper clippings are thoughtfully placed throughout the book. The placement of theses visual elements is well-done so that the flow of the story is not interrupted. Back matter is comprehensive and includes an author's note, glossary, source notes, and an index. If you're a history buff or work with children who are interested in stories from the past, you'll want to add Searching for Sarah Rector to your list of books to read this year. Fascinating. One for the permanent shelves. Thanks!